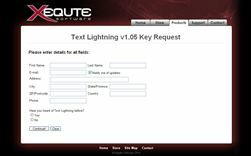 Text Lightning is a power tools for Microsoft Outlook from Xequte. The program has been designed to give the users instant access to the text which have been used to reply to similar message in the past. Besides that, it also allows the users to search all their past reply to a message or contact. One-Click Insertion of Text, Images and Files – All of the phrases and text snippets you commonly write in your messages can be added with a single click (plain text or formatted), and instantly add a selection of files, embedded images and formatted rich text. Product Guessing – Specify a list of your products and their nicknames, and Text Lightning will determine which are mentioned in each message. With this it will personalize your responses and offer only relevant Quick Text. Never Type “Dear Tom” Again! – When you reply to a message Text Lightning automatically starts the message with your preferred salutation using the recipient’s name, e.g. “Hi John”. One-Click Searching – Able to search all your past responses to a message or contact with a single click. Quick Move – Archive messages to your favorite folder with a single click. Customize your Text Templates with Fields. Compatible with Outlook version 97 and above. Visit Text Lightning v1.05 Key Request page, then enter your first name, last name, email address, address, city, state/province, zip/postcode, country, phone and click “Continue” button. Use the received keycode to unlock and activate Text Lightning.